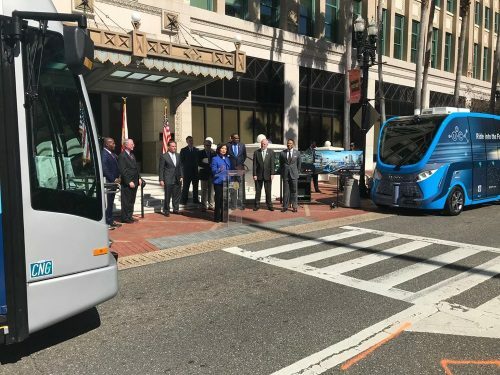 Transportation Secretary Elaine Chao officially awarded the City of Jacksonville, FL, and the Jacksonville Transportation Authority a shared $25 million grant to support two projects in a formal ceremony on Feb. 8. USDOT said that this $25 million grant will fund two separate projects. The City of Jacksonville will carry out the Urban Core Riverfront Revitalization, while the JTA will launch the Bay Street Innovation Corridor. Those two projects will “bracket” the downtown area, according to USDOT – providing major improvements to Bay Street from the Jacksonville Regional Transportation Center at LaVilla in the Downtown Core area to the Sports Complex. “Through highway redevelopment, implementing an autonomous transit network, and introducing smart technologies, the projects will focus regenerative efforts on the riverside area around important local business, sporting, and entertainment centers,” USDOT added.